The highly desirable limited edition exclusive 5 x 10" vinyl set with ten current stage anthems extended old school showcase style to full vocal and dub effect. 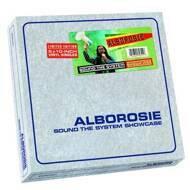 Cut to played loud, white label style and housed in unique Alborosie house bags. Boxed up in eye catching master tape lift off lid box with download card!